There have been many, many movies made about criminals over the years, and one of the most popular sub-genres appears to be those stories which deal with law enforcement officers who go under cover? Why are these so well-liked? Is it the idea of changing one's identity? Is it the intrigue of going into a different world? Is it the suspense surrounding the notion of getting caught in a ruse? Whatever the case, filmgoers seem to love these movies and things get even more appealing when the story is based on a real-life experiences, such as in The Infiltrator. The year is 1985 and drug cartels are flourishing, as they push their products into the United States. DEA agent Robert Mazur (Bryan Cranston) is a master of working under cover and gaining the trust of drug dealers. While the agency has some success of getting the drugs off of the streets, it's suggested that they look at pursuing the big movers and how their money is handled. Working with fellow agent Emir Abreu (John Leguizamo), Mazur assumes the identity of a businessman named Bob Musella. Starting with some local cartel members, Bob advertises his money laundering services, ensuring the drug smugglers that he can keep them flowing in cash. Word of his talents gets around, and soon Bob is meeting with officials from international banks and many members of the underworld. As Bob gets deeper into this identity, it becomes clear that he may have a shot at the biggest fish of all -- Pablo Escobar. I distinctly remember that when The Infiltrator was released into theaters mid-summer I thought to myself, "This is either counter-programming, or there must be something special about this movie." Well, it's the latter which is true, and it's Bryan Cranston which is the something special. This man is clearly very comfortable slipping into characters and he make playing both Robert Mazur and Bob Musella look very easy. After watching him morph into a villainous character on Breaking Bad, it's interesting to see Cranston step into the law enforcement side in this movie. The confidence which he exudes in the character makes it very easy to believe that the criminals would trust and want to work with him. However, Cranston is the only truly special thing to be found here. 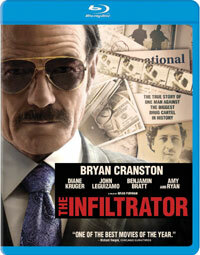 While the rest of the cast is also good, it's in the story department that The Infiltrator is lacking. Despite the fact that this is based on real-life characters and that it offers the added incentive of the tale of actual cartel members, you are going to feel that you've seen it all before. Mazur is the veteran under cover agent who spends too much time away from his family. Abreu is the wise-cracking guy that Mazur doesn't trust completely. All of the bad guys are very stereotypical, save for Javier Ospina (Yul Vazquez), who appears to be in his own movie. There are the requisite moments where it looks like Mazur's cover is going to be blown and he's forced to think on his feet and the awkward scenes where the cartel member display their full trust in him and Mazur is caught between two worlds. The only unique thing here is the fact that Mazur is forced to bring in a fiancee character, played by Diane Kruger. The Infiltrator is one of those movies which is a tough nut to crack. It is in no way a bad movie, but everything here is so by-the-numbers, that it's impossible to give it a rousing recommendation. This is all summed up in the performance by Benjamin Bratt, who plays one of the cartel members. He's essentially doing a better-dressed version of the character he plays on Modern Family, a suave man of the world who is passionate about everything. This epitomizes how everything in this movie feels too familiar. Again, Cranston is great and his fans should certainly check this out. All others get out your "Under cover movie bingo card" and start filling spaces. The Infiltrator will never get all of that cash through customs on Blu-ray Disc courtesy of Broadgreen Pictures. The film has been letterboxed at 2.35:1 and the Disc contains an AVC 1080p HD transfer which runs at an average of 32 Mbps. The image is very sharp and clear, showing no overt grain and no defects from the source materials. The colors look good and the image is never overly dark or bright. The level of detail is notable and the image is never soft. The Disc carries a DTS-HD Master Audio 5.1 track which runs at 48 kHz and an average of 3.5 Mbps. The track provides clear dialogue and sound effects. This is a well-balanced track, as it smoothly delivers the nuances of the dialogue, while also engaging us with effective stereo and surround effects, most of which highlight sounds coming from off-screen. A nightclub scene offer modest, but noticeable subwoofer effects. The Infiltrator Blu-ray Disc contains a few extra features. We begin with an AUDIO COMMENTARY from Director Brad Furman and Bryan Cranston. The Disc contains five DELETED SCENES which run about 9 minutes. "The Three Bobs" (3 minutes) looks at the main character and contains comments from the real "Bob", who is kept in shadows. "How To Infiltrate" (6 minutes) offers three short segments -- "The Psychology", "Identity", and "Danger" -- which examine the aspect of Bob's job.